Westwick towermill stood on Long Common to the north of the village. It is likely that the towermill had been built to replace an earlier postmill, although no record has been found so far. 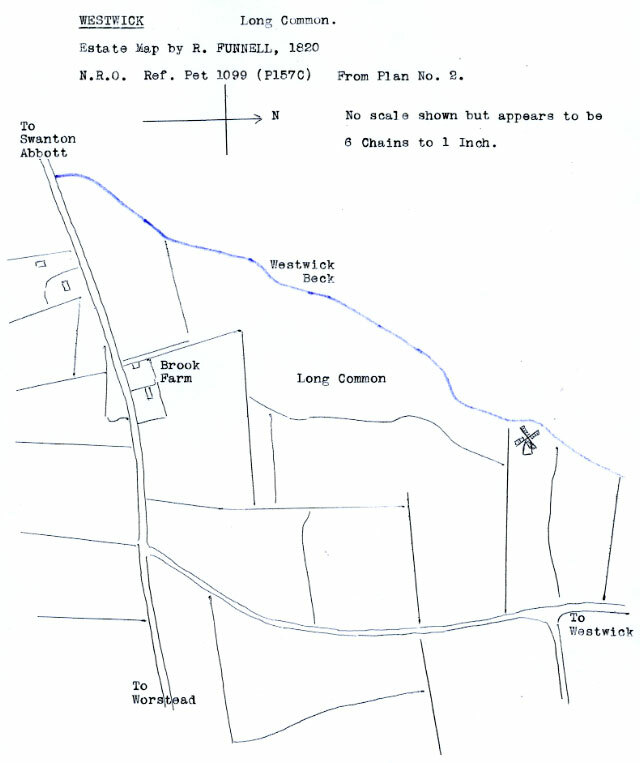 In the early 1800s, the Westwick Estate was owned by John Petre and it was surveyed for him by Richard Funnell in 1820. His resulting map had six plans and the windmill appeared on plan two as a towermill with four single shuttered patent sails. 1. Henry Maye of Westwick, gent. 2. Sir Richard Berney of Reedham, bt. 1. Owen Plumstead of Coltishall, gent. 2. Samuel Sandley of the same, merchant and Anne his wife. 1. Robert Wace of Fulmodeston, clerk and Anne, his wife, widow of Samuel Sandley of Coltishall, gent. decd. 2. Edward Appleton of Horning, cordwainer. 4. Robert Wace of Fulmodeston , clerk and Anne his wife. Messuage, windmill and land in Westwick.